St. John Bosco Church was bedecked Monday morning in holiday splendour. Crimson poinsettias, garlands with red bows, a Christmas tree and a giant creche added an ironic warmth to an otherwise sombre moment. In the pews, more than 200 sat clad in Sunday best. There were no smiles. No holiday joy. Instead, people looked straight ahead, their faces frozen as they used crumpled tissues to dab tears from their eyes. 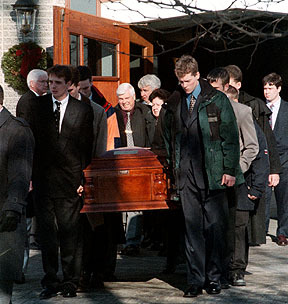 Family and friends gathered at the church to pay last respects to Andrew Moffitt, the 23-year-old son of Paulette and Rodney Moffitt of Brockville, who was stabbed to death two days before Christmas while trying to stop a fight in an Ottawa bar. Henry Danninger, a 26-year-old University of Ottawa student, is charged with second-degree murder in his death. As with all funerals, there was an overwhelming sense of grief. But on this occasion, the pain seemed more pronounced because a life was lost so violently and senselessly. Moffitt's younger brother Michael, 11, could barely conceal his tears, bravely wiping them away as older brother Rod sought to comfort him. �There are no words that can take away the pain or the feelings we have,� Father John Hibbard said in the eulogy. �Why do these things happen? I wish I had an answer. I wish I had the words to console, to be able to reverse what has happened. �All we can do now is come together, grieve and cry together and go through the human rituals that help us deal with what has happened. Hibbard said Moffitt's death brought into sharp focus the existence of evil in the world. However, the priest asked those in attendance not to dwell on that. Instead, he asked mourners to honour Moffitt by remembering the joy he brought to their lives. Hibbard described the computer engineering student as an exceptional man who was the glue that connected his family. A graduate of Thousand Islands Secondary School, he was an avid golfer and hockey player. The third-year University of Ottawa student had hoped to finish school early and join his brother Rod as an engineer with Northern Telecom. The priest also requested those gathered not to allow themselves to be weighed down by the tragedy, or by ill will they might feel as a result of the murder. Instead, he called for forgiveness, even though it might seem difficult. He also asked mourners to remember that God works in mysterious ways to bring good out of human tragedy.